Azerbaijan has an impressive collection of extant fortresses. For many centuries, fortresses, bastions, citadels protected the borders of the Azerbaijani cities and khanates. The life of great Azerbaijani rulers was closely related to many of these fortifications. The stories of the fortresses themselves are overgrown with legends. The fortress is located 4 km from the Talystan Village, on the right bank of Agchay River. The pride of Ismayilli is associated with the name of the outstanding Albanian commander and ruler Javanshir Mehranid, who ruled in 642-681. The word "Talystan" means "Tala Meskeni" - "settlement in the meadow". There are traces of four ancient settlements and five cemeteries in the village. The first archaeological excavations were made here in the 60s of the last century, as a result of which it turned out that this territory has at least 2000 year long history. Javanshir fortress can be reached only on horseback or on foot. This powerful defensive system consists of the outer and inner part known as ichgala. Ichgala was built at the very top of the cliff. It is believed that the guilty were dumped from this rock down into the abyss. There was an underground tunnel to the Maiden's Tower located at a distance of 7 km from it. Over time, the tunnel collapsed, but some of its parts have survived to this day. Located in the upper northeastern elevated part of the city, Shaki fortress was built during the reign of the first Shaki khan, Haji Chelebi (1743-1755). There are two gates and defensive towers at the southern and northern sides of the fortress. In the Soviet period, the destroyed parts of the fortress were restored. There were forty buildings inside the fortress at different times. Among them is the Palace of Shaki Khans built in 1762. The summer residence of Shaki Khans was constructed without nails or glue. If you are drawn to the beauty, history and mystery of ancient places, then visit this legendary fortress. One of the most famous historical sights of Shaki was built in the 15th century by the Shaki ruler Alijan. The name of the fortress is associated with the invasion of the ruler of Iran, Nadir Shah. In 1743, the ruler of Haji Chelebi, having declared himself the Shaki khan, took refuge in this fortress and rejected Nadir Shakh’s demands for deposition. The angry shakh demanded to know the reason why Chelebi does not give up. Confident of the fortress’s inaccessibility, Chelebi told the shah "Come and see," (Gelersen - Gorersen). In 1744, Nadir Shah arrives in Shaki with a huge army, but couldn't captivate the fortress. Today the fortress is a must- see place to visit for all the tourists coming to Shaki. There are many deep wells near the fortress. Some people say that this is a trap for enemies. Stunning views from the fortress won't leave anybody indifferent. Majestic mountains, emerald forests and Kish river fascinate nature lovers as well as those who wish to explore the magnificent landscaping. If you get here in September, you can taste ripe dogwood, which grows in abundance near the fortress. Ancient Ganja has an extremely rich and interesting history. With its many historical sites, the region charms tourists from all around the world. Ganja Fortress.can be attributed to the list of the most majestic sights in the region. 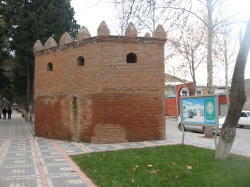 Fragments of its powerful walls can still be seen in the territory of the oldest city park "Khan Bagi". In 16th century, Ganja turned into a battlefield between the Ottoman and Safavid states. Then there was the need for powerful fortifications. The famous Ganja fortress, known as the "Shield of All Asia", was built in 1588 by the commander of the Turkish army in the Caucasus Farhad Pasha by order of the Turkish Sultan Murad III. The total length of the walls, erected 7 km from the historical center of Ganja, reached 13.7 km, and its height was 12 m.
The local river stone and clay were mainly used in the construction of the fortress. The south-western, north-western and eastern walls of the fortress were strengthened with the red brick. Every 200-500 m along the walls, about 30 defensive towers were erected. At the end of the 16th and beginning of the 17th centuries, divided by the fortress, Ganja consisted of four parts: the outer city, Shahristan (Posad), Ich-gala and Narin-gala. In 1804, Russian troops under the command of Tsitsianov besieged Ganja. After repeated proposals to the governor of Ganja Javad Khan on the voluntary surrender of the city and a decisive refusal ("You will enter Ganja only over my dead body"), Tsitsianov stormed the city. As a result of this assault, Javad Khan and his middle son Huseyngulu Aga fell heroically in a stubborn battle, and Ganja was occupied by the enemy. The fortress was destroyed, and in its place blocks of the European sample were built. 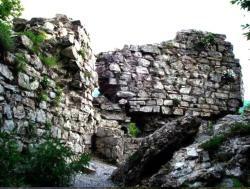 Only one fragment of the fortress walls survived, which now bears the name "Shiralibek Tower". In 2007, reconstruction works were carried out here. 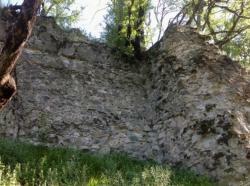 By the way, you can still see the half-ruined remains of the walls of the ancient fortress near Ganjachay river. The legendary fortress of Gulustan in Shamakhi is one of the greatest monuments of Azerbaijan. It received its name due to the scenic area in which it was located ("Gulustan" - means "flower garden"). Built in the 8th-9th centuries, this powerful fortress served as one of the main strongholds of the Shirvanshahs state. 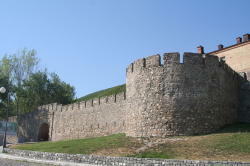 The territory of Gulustan fortress was surrounded by powerful walls with numerous round and quadrangular towers. In the 14th-15th centuries, Gulustan fortress serves as one of the residences of the khans of Shirvan. During the archaeological excavations in 2011, an underground passage built during the times of the Shirvanshahs state was discovered in the fortress. Equipped with steps carved into the rock, the underground corridor led from the fortress to the bank of Zogalay river, which flows nearby. At the beginning of the 16th century, Gulustan fortress was captured by the Safavid ruler Tahmasib I and destroyed. Having put an end to the existence of the state of Shirvanshahs, the Shah destroyed the symbol of independence of Shirvan - the fortress of Gulustan. Then, during the Safavid-Ottoman wars, the fortress conquered by the Ottomans was restored, and the Turkish garrison was located there. 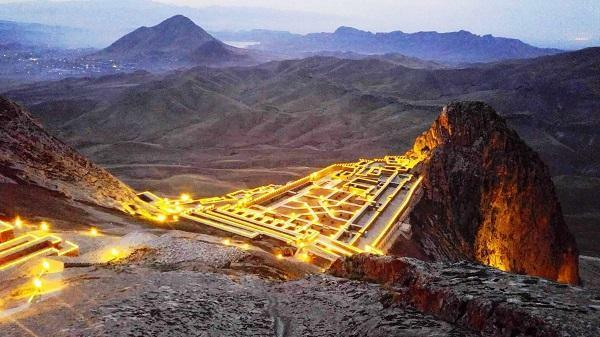 The ancient fortress city of Alinjagala was erected in a stepped form on the slope of Mount Alinja in Nakhchivan. Some researchers believe that it was built 2,000 years ago. Once this mighty fortress was the residence of Zahida Khatun, the ruler of Nakhchivan. During the reign of the Eldiguzids dynasty, the treasury was kept there. The massive walls of the fortress were built of burnt bricks and large stones. During the Atabek State state, water tanks and fortress towers were built to strengthen the defense in Alinjagala. For 14 years Alinjagala resisted the forces of Timur. Restoration works were carried out in the fortress. During the work, the ruins of houses, samples of material culture, coins were discovered. The fortress had about 8 reservoirs, carved into the rocks, one of which was 5 meters deep. Currently, the fortress of Alinjagala is open to the public.